Daily objectives (can-do statements) are one of the biggest game changers for me over the years! They force me to narrow in on a purpose for the lesson and help me stay on track as I plan. I’ll be the first to admit that I’ve definitely missed the mark on many of the goals I’ve posted on my whiteboard over the years. I’m grateful for those who helped me evaluate these goals, and for those who brainstormed ways to improve them! Here are a few questions that I found helpful when evaluating my daily objective so that it supports proficiency and our World Language Standards (5Cs). Is there a CULTURAL CONNECTION? Culture isn’t meant to be taught on its own; it’s part of a balanced lesson. By including a cultural touch in the daily objective, you’re telling students that language skills AND cultural knowledge are both important. Plus, it gives you a purpose for leading the lesson with authentic resources and a context to compare cultures. Is it targeting the RIGHT PROFICIENCY RANGE? Goals that are too advanced or too simple cause students to check out. Plus,in a class of 30+ students… there is no way they are all at the exact same proficiency (sub) level. However, if you choose your CAN DO words wisely, you can set a goal that ALL students can accomplish at their own proficiency level. This one seems easy, but sometimes we forget that novices in a high school are practically adults even though their second language skills are limited. They may not be engaged in or motivated by “kid friendly” materials. Other programs may reach intermediate in middle school (which is rare) but need to keep in mind what is appropriate and interesting to that age group. Do they care about food additives or steriod use among athletes? Probably better to discuss that when they are older! Is it MEASUREABLE by the END OF THE CLASS? If our goals are too big, they may need to be “unpacked”. If they are too small they may need to team up with another goal. Pretend you’re not a runner. Pretend you’re training to run a marathon this summer. Would either of these goals help you train tomorrow? 1.) Run 20 miles. 2.) Run 20 feet. Probably not! That trainer needs to find out what you can do, and help you improve little by little each day. In the same way, students need bite-sized goals that they can accomplish each day that help them reach a big goal over time. Let’s look at the follow can-do statements together. You may want to do this with a colleague or WL department. I’ve found that eyeing other objectives helped me better see the shortcomings in my own so I can improve them! Take a look, think it through or talk it out, then click the questions below to see how we rated each example. How does this objective measure up? Not really. If you argue that communication is there, it’s novice low at best. When’s the last time your called a friend and said… “Bank, park, school, store….MALL!” It’s a goal that is purely vocab driven with no communication tied to it. How could you improve it? Tweak the goal. Example: I can give my opinion about places in the city. I can recommend different places in my city to visitors. Add a specific city from the target culture. Example: I can give my opinion about the best places in Barcelona. I can talk about the best places to visit in Shanghai. Is it targeting the right proficiency ranges? No. Everyone would produce the same thing. 7 words. Novice low. Even if they are new to the language, you could add a phrase and push them to novice mid or novice high. Don’t bring students back to novice low if they are able to do more. Tweak the wording of your goal. Example: I can give my opinion about places in Barcelona. I can recommend different places in my city to French tourists. Elementary: Sure. Younger kids could talk about a city. Keep it relevant to what your students would care about though. Parks, museums, and zoos might be more age appropriate than banks, police station, and doctor’s office. Is it measureable by the end of class? Yes. You could see if students could list 7 words. 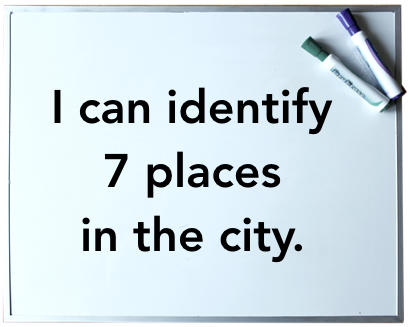 Better yet, you could also ask students to give an opinion about places in Barcelona, Montreal, etc. and measure their response with a proficiency rubric. Words? Phrases, sentences, or paragraphs? Then it can lead to giving opinions about the best, worst, and most unique uniforms… real people do that! (I always like talking about the skaters’ uniforms.) What colors are they wearing? Is it modern or traditional? There’s a lot to say. Since this is an international event, it would be fun to guess where the athlete is from based on their uniform color/style? What does our look say about our culture? Are certain cultures more/less modest? Elementary: Yes. They could talk focus on colors and just one specific sport. Middle: Yes, it works for them! High School: Sure, it’s appropriate for them as well. 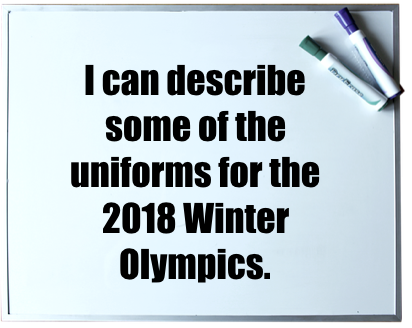 Let each student choose the sport/uniforms they want to talk about. In one class you could get input by reading an authentic article or social media posts about the uniforms from your target culture, look at current pictures or a video and discuss them as a class, and then have student describe one specific team’s uniform by the end of class. Measure their descriptions with a proficiency rubric (for feedback – not a grade). How can you improve this Can-do? It is lacking a reason to communicate AND a communcative topic. Novice Learners: No. They don’t need to be focused on tenses as a novice. Intermediate: No, and here’s why. Intermediates can start to use different tenses, but not accurately and not all the time. Remember, proficiency is about communication – not perfection. This target also misses the mark because it’s really just focused on specific words (with accurate endings), and intermediates are communicating at paragraph level. It’s not inappropriate but it’s not really exciting for any group either. It’s definitely not something they will go home to talk about with their friends or family (besides maybe that one student who LOVES grammar). If the goal narrowed in on a specific verb then it would be. 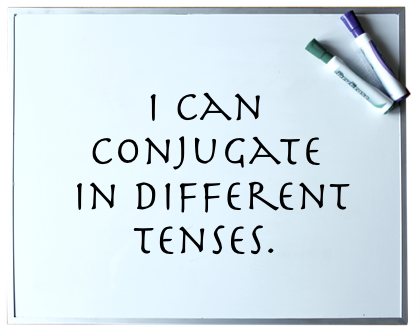 Can I really check whether or not a student can conjugate any verb, in any tense? Not enough hours in the day! I can see this as a debate on a park bench! Students need input about the target culture AND need to be able to talk about their own culture. Knowing only one side isn’t enough. Yes. This could be done at a range of proficiencies both at the novice and intermediate level. Elementary: Yes. 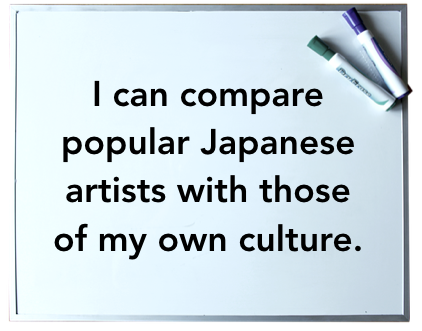 They could learn about a Japanese artist that writes kids manga books and compare the artwork in one book to one from their own culture. High: Definitely. Students could explore their favorite type of art (tattoos, graffiti, etc) for this comparison. Yes. Thank goodness for a good proficiency rubric. It makes life so much easier. Give students a real life reason to use letters. Example: I can tell my social media usernames. 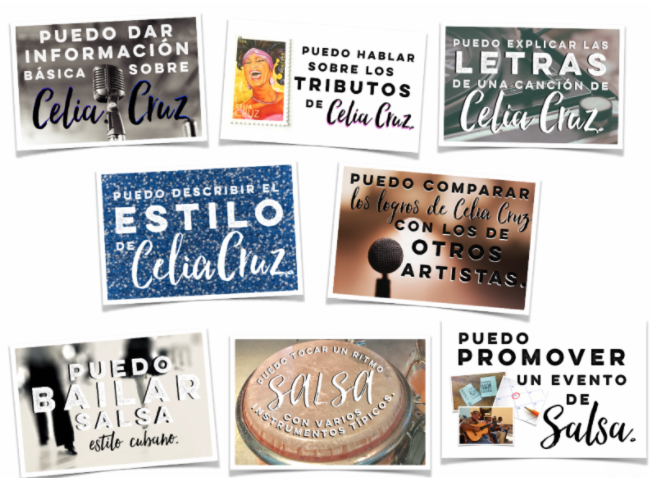 If you consider letters than don’t exist in the students’ native language or teach the alphabet with a cultural song, then it connects to culture. Asian languages with symbols can connect to the practice of writing letters and how native speakers learn the characters. Saying the alphabet is less than novice low. It’s not even words. I once used this as a goal for a level one class and I remember seeing the native speakers’ faces as she came in the class. They were solid intermediates and being brought back to NL just like everyone else. There’s no way to say the alphabet as an intermediate. Elementary: Yes. 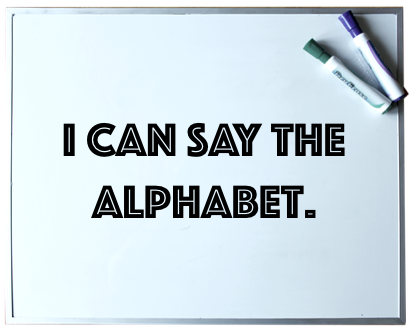 If they are learning the alphabet and working on spelling in their own language then it could make sense to do it in a second language. Middle: No. Not without a purpose for spelling. High: No. Not without a purpose for spelling. Technically you could measure this… but all production will be novice low and it probably would take more than a class for little ones to master anyone. I can see myself sitting down with someone talking about how to make a new dish. It’s more than a Disney movie! Students need to know that. It won’t be on the menu at Applebee’s but it’s most likely on a traditional French menu. You could easily find authentic resources for students to learn from. Yes. I think this could be done simply as a intermediate low and with more details at even higher levels. Elementary: Probably not. Most kids that age aren’t cooking for themselves. However, they could give their opinion after tasting it or talk about main ingredients. High: Yes, while most still can’t cook for themselves, it good for them to try and it’s something they can learn. Definitely. It’s not too big! Summarize how to make this dish to your Canadian friend who can’t find a recipe. It’s easier to critique when it’s not your work, isn’t it? So that means if you need help evaluating your daily objective, invite a colleague or leader in your class and let them help! Your can-do statements may not perfectly align with the suggestions in this post, but they are worth considering as you cover the standards and shift toward proficiency. We all have an area we can improve on… For me, it was this and improving my can-dos had a big impact on my lessons and the results. I hope it does for you, too. Great post! The message is simply and honestly explained. and clearly demonstrates the point. Thanks for showing how some statements can be improved to make a connection with the lives of students. Thank you! 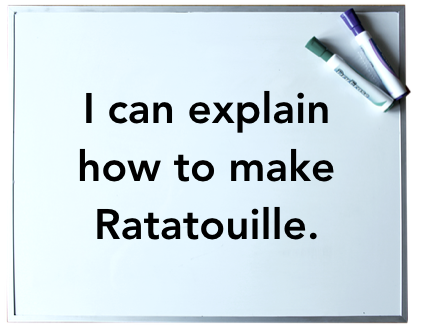 A good “can do” also helps me think of what that lesson should look like (what authentic resources for input, what tasks/activities to follow-up). You gave me a new idea! For the Olympic uniforms, there is usually an article that comes out talking about who/what company will be making the country’s uniforms and what they will look like, especially for the Opening Ceremony. Photos and videos from the Opening Ceremony would be useful to look at. The evaluation portion makes this an effective tool for those who are learning – thank you! These kinds of tools help those of us who work with teachers. Thought provoking. However, I would like to see what you mean by a novice giving opinion/recommendations about places in a city. “Add a specific city from the target culture. What I love about a good can-do is that all students can complete it at their own level. In any given class, you’ll have a range of proficiencies. In my level one classes, at this point in the year most of my students novice high or intermediate low, with a few still at novice mid. Novice Mid: “Me gusta Las Rambas. Muy interesante. Mucho arte y compras. Muy diferente. Learning about this in class and I think this is a great foundation of learning for all of us soon to be teachers! Fantastic! I am just learning about can-dos and wanting to incorporate them into my curriculum. This is so thorough and the examples really demonstrate what is successful and what is not. I learn best by modeling. Thank you so much for sharing this! Glad it was helpful, Laura! Thanks for letting us know!